Happy New Year! And thank you to everyone who read this blog last year. I was looking at page views to see what kinds of posts I should write more of this year, and this was the most viewed post on my blog last year. I first posted it back in February. 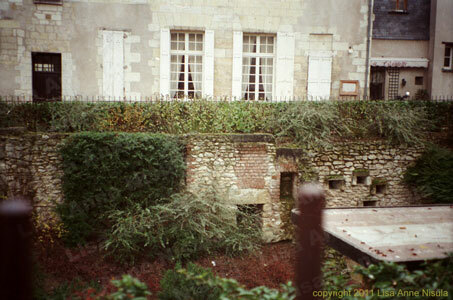 I came across these pictures when I was going through photos of the Old City in Tours, France. (I needed those for description inspiration for Wizard at Pembrook, and don’t be surprised if they end up in another blog post about Tours.) 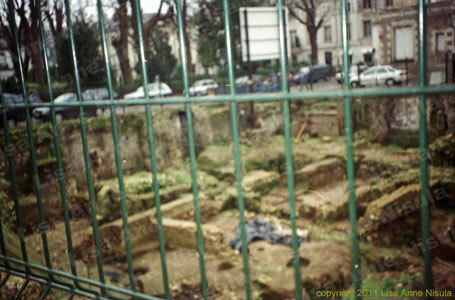 I remember my friend and I stumbled upon these ruins not long after we had been on a walking tour of some part of town or another, where we had learned that you could make a pretty good guess at the era ruins came from by looking at the size of the stones- the smaller the stones, the older the ruins. We guessed these were Roman, and we were right. I took a picture of the sign so I could look it up later, but there were too many other interesting things to investigate, and I never got around to it. 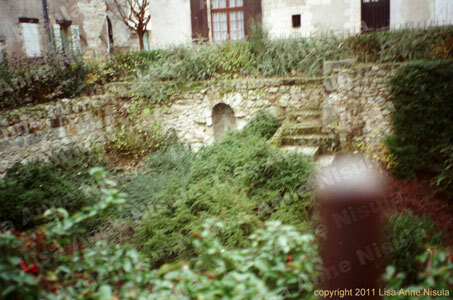 Good thing I had the picture, since I have no idea how I would look up possibly-Roman-ruins-with-interesting-green-plants-somewhere-in-Tours-in-the-90’s. 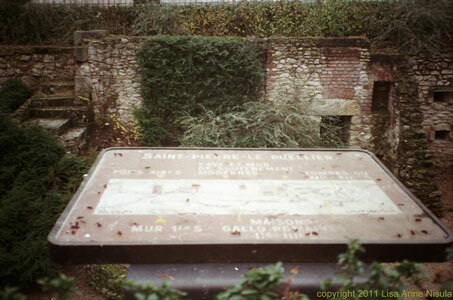 The place is called “Jardin de St Pierre le Puellier” or “The Garden of St. Pierre le Pullier” in English. It’s one of those archaeologically layered places. There had been a 12th century church there, which is where the name comes from. The church was destroyed in the 19th century, although I think part of a wall is still there. Before that, there was a convent built by St. Clotilda, wife of King Clovis, in 512. 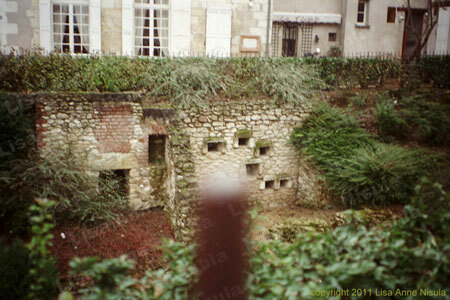 And before that, it was part of the Gallo-Roman settlement (Gaul (old name for France) under Roman rule). The sign says on top, “wells from the 19th century, basement and retaining walls modern, tombs 12th and 13th century (years are hard to read there)” and on the bottom, “wall 1st century (again, hard to read), Gallo-Roman house 2nd and 3rd centuries” Trying to look at the diagram, I think the tombs are the small openings on the right, the red brick and stone by the steps are the modern wall. The web page for the tourist bureau of Tours only mentions “remains of the bathes of a privet dwelling” by the royal chateau, so I assume those are these. All of the other Roman ruins mentioned are part of the walls surrounding the city or other fortifications, so not part of a Gallo-Roman house. 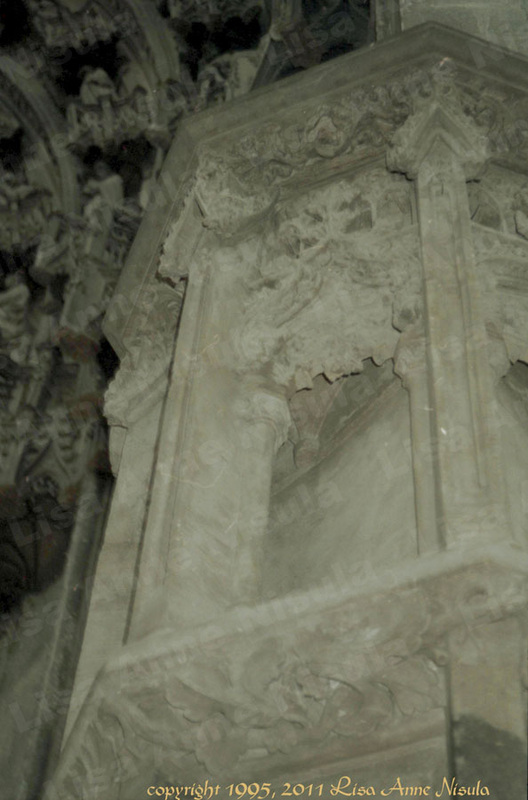 I promised pictures of the Cathedral St.-Gatien, and here they are. When I was there, the cathedral was in mid-restoration (it seems like something’s always mid-restoration when I’m there), so I got to watch the masons cutting stone to replace what needed replacing, which was interesting, and I took this picture of a sign explaining the history of the area. The cathedral is not near the old city, it’s actually on the other side of the Rue Nationale, which runs through the center of town. On one of the walking tours I took, they told us that the Rue Nationale was originally the Rue Royale, or Royal Road, in English it’s usually called the King’s Highway. During the Revolution, when they got rid of all signs of the monarchy, all towns that had part of the Rue Royal re-named them Rue Nationale. But back to the cathedral. 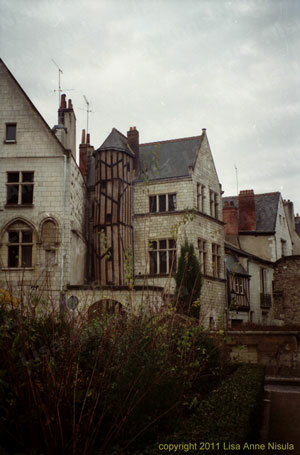 The old parts of Tours are split into two areas. 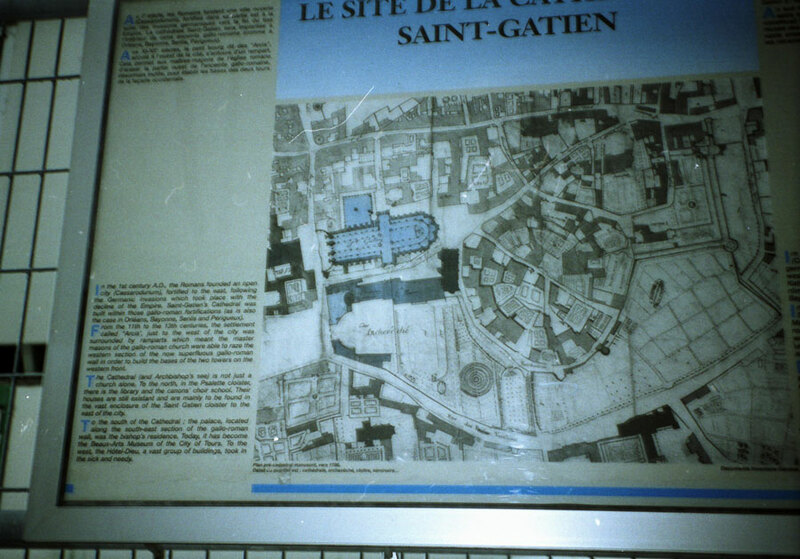 The part with Place Plumereau and the remains of the Abby of St Martin, which was a pilgrimage site, was the economic area; the cathedral and chateau were in the old Roman walled city. Between them were vineyards and fields. 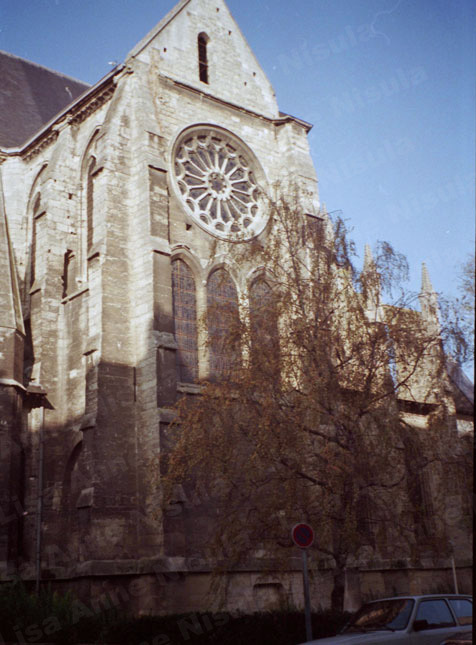 The cathedral is named Cathedral St. Gatien, after the first bishop of Tours. 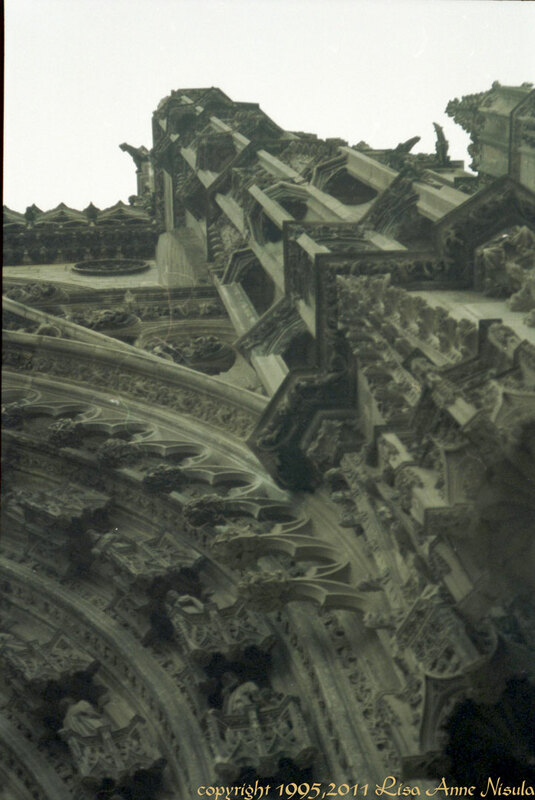 The first building there was built in the 4th century; the cathedral was built in parts from the 12th through the 16th, so there are a lot of different styles of Gothic architecture. 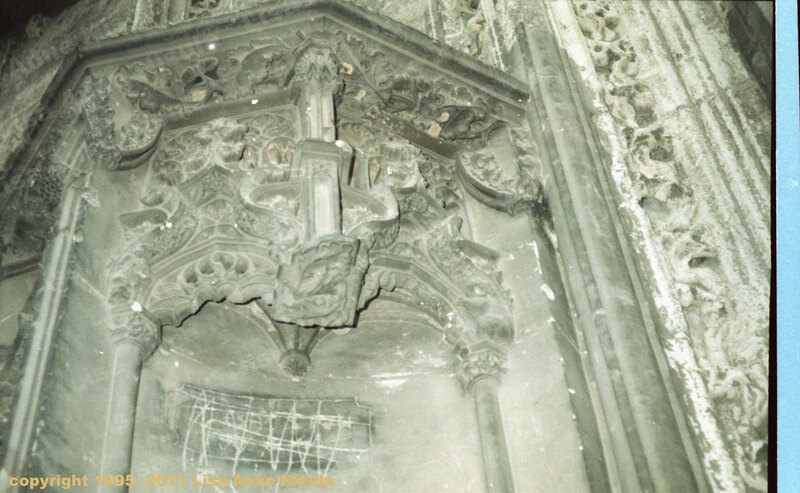 The area around the doors (which seems like the front, but is really the back- the area around the altar is the front) is flamboyant style, with lots of carving, which is why I have lots of pictures of it. 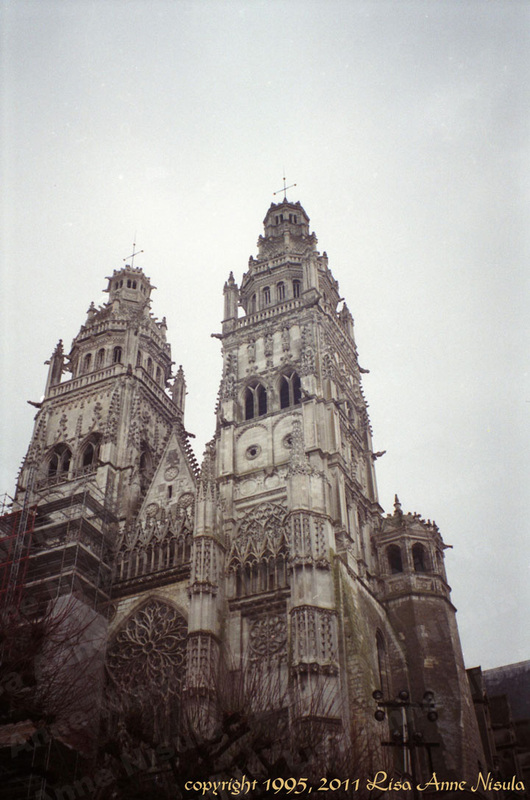 The towers are French Renaissance style. You can see by the scaffolding in the first picture, they were part of the restoration, so I didn’t get to see much of them. Behind the cathedral is what used to be the bishop’s residence. Now it’s the art museum. I’ll see if I can find some pictures for next time. And here’s an update on the picture I was messing about with in Daz Studio. 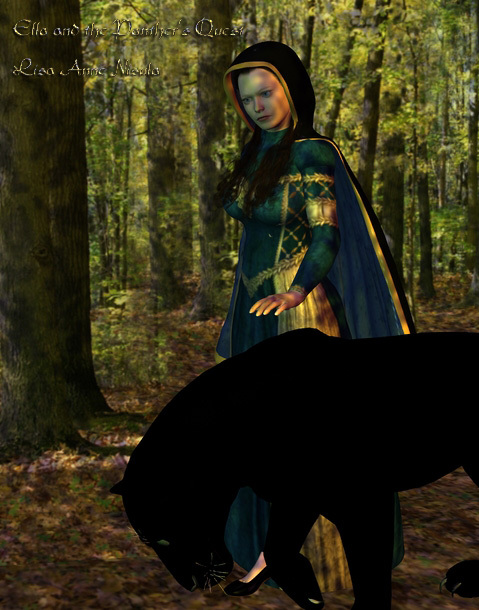 Ella and the Panther. These are the pictures I was looking for when I came across the Roman ruins I posted last time (That was one of my most viewed blog posts. I’m not quite sure why, but I think some people were tweeting it, so if you did, thank you very much, I really do appreciate it) Anyway, I was looking for pictures of the old city and only found a couple. 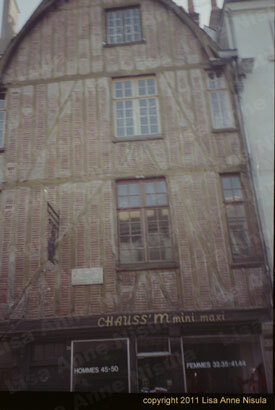 Unfortunately, this was the days when digital cameras were expensive and very low resolution, so I had a film camera, and somehow, a lot of my film was damaged, so lots of the pictures I took didn’t survive and I have odd gaps. I was living in the old city when I was there, but only have a few pics of the area. Here they are. This is a building in Place Plumereau, a pedestrian only square in the middle of the old city. 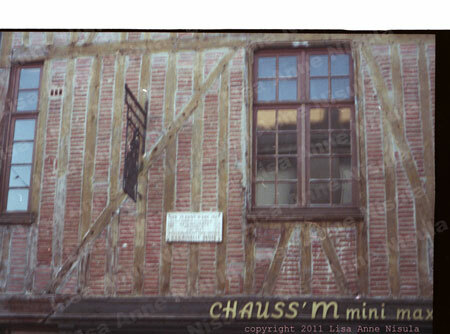 All of the buildings were this wonderful old 15th/16th century places. I don’t remember going into this building, but the signs make me think it was a clothing store. I think I was trying to get a picture of what the sign said, but all I can make out now is that Joan of Arc did something here. I think it was where she had her armor made. We heard a lot about her on this trip, but the story I hadn’t heard before was the theory that it wasn’t Jeanne d’Arc, but Jean d’Arc (Jeanne is the feminine form of the name, Jean the masculine) and the names and the story got confused as it traveled away from the battlefield. I don’t know if that was a common theory or just something one teacher had heard, but it was interesting. This picture always seems very typical of Tours to me, although I’m not sure why. I don’t remember going past this spot very often, so I think it might be near the Roman ruins from my last post. When I was there, I stayed on Rue de la Grosse Tour (street of the Fat Tower), named after the bell tower from the ruins of the Basilica St. Martin, which was not actually on the street, but visible from it. It was a really nice place to be since the door to the apartment building opened onto Rue de la Grosse Tour, so we had the cool little street to walk home on. And I do mean little, if your arms were a little longer than mine, and you really stretched, you could touch the great old buildings on both sides of the street. It made the barricades in Les Mis make more sense; that kind of street could be barricaded with not much more than a couple sofas and a dining table. We were on the corner though, near Les Halles market, so the building itself was modern, or modern for the area at least, meaning we had all the charm of the old city, without the problems of ancient buildings, although I do think a nice 400 year old building would have been fun too.